Jeff Sutton, Wattle Farm stud, Temora, with the grand champion Border Leicester ram, judged by Ian Cameron, Narromine. Entries were less than in past years, but that did not mean the quality of the Border Leicesters on show was in any way diminished. Having just sold his stud in its entirety, judge Ian Cameron, “Nundoone Park”, Narromine, skillfully worked his way through the various classes. Jeff Sutton, Wattle Farm, Temora, was most successful exhibitor in the breed taking all of the championships, along with the group for entry in the Peter Taylor Memorial Perpetual Trophy. 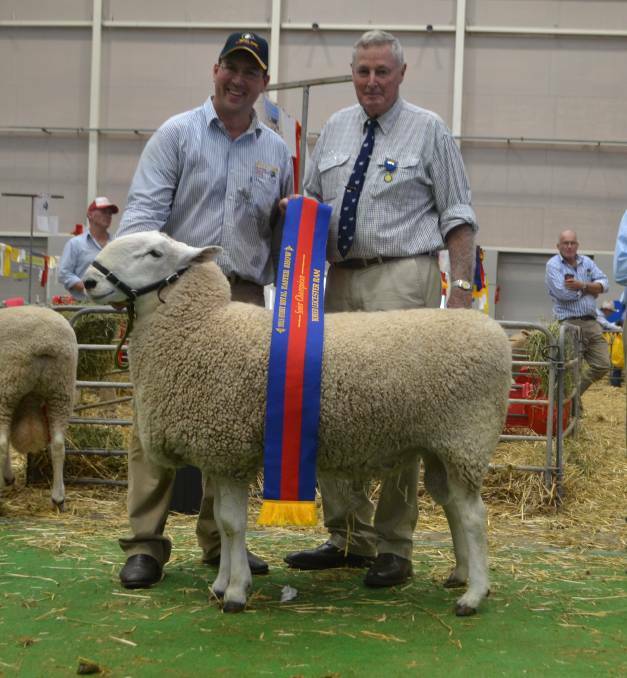 The junior champion ram and also winner R. P. Harper Perpetual prize was thought by Mr Cameron to be an outstanding example of the breed noted for its importance in the production of first-cross ewes. “He has a great outlook, good on his legs and is the standout ram,” Mr Cameron said. Reserve junior champion ram was also shown by Wattle Farm, Temora. “He is a very good ram but lacks the finish of the champion,” Mr Cameron said. The senior champion ram was awarded to Wattle Farm, Temora for thier exhibit which was successful in the over one year and under two years class, while the reserve senior champion ram was paraded by Scott and Kylie Anderson, Talkook stud, Crookwell. The Brian Walton Memorial Perpetual Trophy for grand champion Border Leicester ram was presented to Jeff Sutton, Wattle Farm, Temora for his exhibit which had previously been awarded the junior championship. Mr Cameron was particularly impressed with this young sire, and said his overall balance and conformation took him ahead of the competiton. The reserve grand champion ram was exhibited by Peter Matus, Tara stud, Rockley (also exhibited in the milk teeth class), while the Talkook stud, Crookwell were successful in the Production class. In the female section, junior champion and reserve junior ewe were both exhibited by Wattle Farm, Temora with the champion coming from the closely and evenly shorn class. Mr Cameron was impressed by the outlook of the junior champion. “She is a big and upstanding young ewe with a dense fleece, very good on her legs and with an excellent carcase,” Mr Cameron said. The junior champion ewe was sired by Coolawang Victory, and this was her first show. The senior champion ewe was exhibited by Wattle Farm, Temora, having graduated from the over two year class, while the reserve, successful in the over one and under two years class, was exhibited by Scott and Kylie Anderson, Talkook stud, Crookwell. Mr Cameron noted the senior champion was a powerful and upstanding ewe, standing well on her feet. “The reserve is a very neat ewe, but I would like to see a bit more stretch,” he said. The ewe grand championship was awarded to Wattle Farm, Temora for their senior champion ewe. The style of the older ewe, with a lot more stretch was enough for her to win.